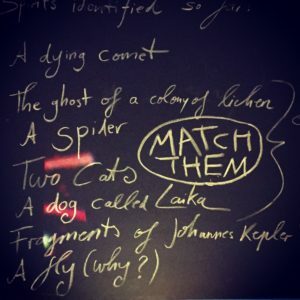 A mysterious machine in a room haunted by ghosts made of light, The Restless Spirit Projector is an interactive game designed by children’s author & illustrator Viv Schwarz and Jonatan Van Hove featuring characters and scripts written by Amber Hsu. Commissioned for the Now Play This 2017 Festival at Somerset House London, this interactive installation invites you to listen in on the secret yearnings of ghosts. Featuring sound design and music by John Peacock, the installation also included special voice cameos by Alexis Deacon and Jason Mitchell. All of the illustrations and animations on this page were created by Viv Schwarz. For more on this game and Viv’s work (including her beautiful children’s books) please visit her website here.